The "Victorian Port City" of Manistee is a favorite destination in Northwest Michigan. Manistee is part of the Lake Michigan Circle Tour and is also the gateway to scenic highway M-22.This is where history, beauty and nature come together to form a unique town that is a favorite destination in Michigan. Manistee has so much to offer today's traveler, and it's a terrific getaway for families or friends. First Street Beach: One of Manistee’s favorite public beaches, First Street beach has restrooms, concessions, universal accessibility, playgrounds, volleyball nets and everything you need for a perfect beach day. Vogue Theater: The historic and newly renovated downtown theater offers the latest movies, independent films, and hosts fun events. Little Manistee River Weir: Operated by the Michigan Department of Natural Resources and open to the public, the weir regulates steelhead and salmon annually and it's a great place to learn more about the Little Manistee River. Ramsdell Theatre: A historic theater, with gorgeous Victorian architecture and art, that hosts everything from performances to exhibits to wedding receptions. Lake Michigan beckons you to its golden beaches and spectacular sunsets. East of town, the magnificent Manistee National Forest stretches for miles and is a nature-lover's paradise. Wildlife is found in its natural habitat, and recreation activities include camping, hiking and biking. The Big and Little Manistee River offer superb opportunities to fish, canoe and kayak. Bring the family to Lighthouse Park on Cherry Street or have a bonfire with friends on Fifth Avenue Beach. 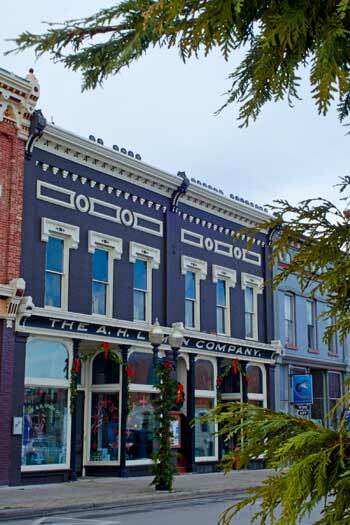 Historic downtown Manistee boasts several buildings still standing from the Victorian Period. Walking downtown feels like taking a step back in time. Spend time browsing the shopping district, with everything from unique kitchen products to speciality antiques to trendy clothing and shoes. Satisfy your hunger at one of Manistee's exceptional restaurants, like the new North Channel Brewery. Take a stroll on the 1.5 mile Riverwalk, which is found behind the downtown district with handicap accessible with ramps on both ends of the Riverwalk. From here, watch the bridge rise for large boats cruising down the Manistee river. Appreciate the history and architecture of Manistee, especially the Ramsdell Theatre. Here is where James Earl Jones got his start, and it is still the venue for a variety of performances. The newly renovated Vogue Theater is open and features current films and holds special events. Built in 1938, is a celebrated return to Manistee, lighting up downtown River Street with its large retro sign. The S.S. City of Milwaukee is a 77-year old Great Lakes ship, permanently moored just north of downtown Manistee. It is open for tours, and during October, transforms into a Ghost Ship for the Halloween season. Numerous golf courses, the Little River Casino Resort, Blacker Airport and the beautiful outdoors make Manistee a dynamic destination with a little something for everyone. Discover the fun at the beginning of the M-22 highway! You can also visit our Travel Manistee website for everything going on in Manistee! Manistee is a great place to be — all year long! There's always something fun going on, no matter what time of year. Manistee is part of the Lake Michigan Circle Tour and is also the gateway to scenic highway M-22.